Apartment Stabu 61 offers self-catering accommodation located in Rīga. Free WiFi access is available. 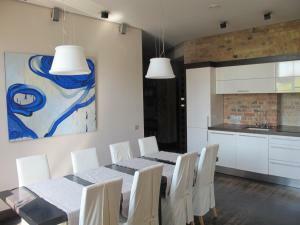 The property is 1.9 km from Arena Riga and about 1 km from the beautiful Old Town. The stylish and spacious apartment will provide you with a flat-screen TV and a seating area. There is a full kitchen with a dishwasher and a microwave. Featuring a bath or shower, private bathroom also comes with a hairdryer and towels. If you feel like visiting the surroundings, check out the famous Freedom Monument which is 1.3 km away. Riga Airport is located 10 km from Apartment Stabu 61.